In a few weeks, I am going to see "Indian Ink," a play by Tom Stoppard at the Roundabout Theatre. My main reason is to see the luminous British actress Romola Garai. While most of the press focuses on the other actress, Rosemary Harris, who is well-known on both sides of the pond, it is Garai that I wish to see perform. As one who watches a lot of British television, I have become familiar with this wonderful young actress and have often wondered why she is not as well-known here in the states as some other British actors. One of my resolutions this year is to get tickets for shows which feature the actors who are well-known for being at the top of their game. This, after missing Philip Seymour Hoffman in "Death of a Salesman," Cherry Jones in "The Glass Menagerie," and Audra McDonald in "Porgy and Bess." Luckily, I had another opportunity recently to see the magnificent McDonald as the legendary jazz singer Billie Holiday in "Lady Day at Emerson's Bar and Grill." Coming up in the spring are two more of my favorite British actors: Carey Mulligan who I did get to see in "The Seagull" in 2008 and Bill Nighy in "The Vertical Hours" in 2006. They're coming to Broadway in "Skylight," a play by David Hare which had a sold-out engagement in London. I have always loved the theatre as evidenced by my 15 binders filled with Playbills beginning with my first show,"The King and I," in 1952. I guess I'm as eager to see great performances live as sports devotees wish to have tickets to see their favorite teams play in person. Some people may clamor for tickets to hear a favorite band or attend a game by their favorite football team. Me? I love to hear writers that I admire. When you're interested in a subject, it's fun to hear experts speak about their fields of expertise. Because books and language have been a life-long interest and occupy so much of my time, I love to hear an accomplished author talk about the process of his or her writing. It tops my list of favorite things to do. This past week I had the pleasure of meeting Colum McCann when he visited a bookstore in Montclair. The occasion was the release of his novel Transatlantic in paperback. Dressed as he often appears on his book jackets, scarf draped casually on his white shirt, McCann charmed the audience with selections from this latest novel. The book is divided in three sections, one of which is a version of Frederick Douglass's book tour in Ireland in 1845 where he lectured about the abolitionist cause. The last section of the book centers on Sen. George Mitchell who went to Belfast in 1998 to shepherd Northern Ireland's peace talks. The third crossing of the Atlantic happens in 1919 when two aviators fly from Newfoundland to Ireland. Fictional characters throughout connect these three sections. McCann is the renowned author of Let the Great World Spin which won the National Book Award. He told his audience how the idea for a novel has to germinate. It is not rare for an author to work many months on a book and then decide to either abandon it or revise the entire manuscript. When I lived in Albany, I had occasion to hear speak Richard Russo, winner of the Pulitzer Prize for fiction for Empire Falls. He explained some of the better ways to create dialogue. When Doris Kearns Goodwin came to Albany to receive an award she spoke about the years of research she undertakes for her works of American history. Several months ago, Christina Baker Kline, author of the best-selling Orphan Train, was at the Montclair Library and spoke at length about her research into the years when abandoned children in East Coast cities were sent to the Midwest to be adopted primarily by farm families who needed them to provide additional labor. Norris Church Mailer, the widow of Norman Mailer, visited the Cedar Grove Library a few years ago, and read passages from A Ticket to the Circus, her memoir of her life before and after she met and married the noted author. Last night I attended the world premiere of a documentary called "The Rule" at the Montclair Film Festival. The film tells the story of St. Benedict's Prep, a school in the heart of Newark run by the Benedictine monks of Newark Abbey. It shows how the monks and the school staff strive every day to improve the lives of inner-city African-American and Latino teenage boys. The film doesn't flinch when it shows how the demographics changed Newark over the years, how the riots decimated neighborhoods, how poverty, drugs and the seventh highest murder rate in the country make it difficult to raise children. The core of the film shows how the school confronts the lack of trust, neglect, deprivation, and violence that can result from the absence of a father. At St. Benedict's boys learn the tools of trust, of responsibility, of the dignity of work. The school provides boarding for some of its most vulnerable boys but most of the boys have to return to their own crime-ridden neighborhoods when the school day ends. A Q&A followed with the film's directors, the school's headmaster, a teacher, and one of the students. When asked what he deemed the school's greatest success - besides the near 100% college acceptance rate of the boys - Father Leahy replied he is most gratified when a former student comes back for a visit and brings his own children. The film's title derives from The Rule of St. Benedict, a book of precepts written by St. Benedict of Nursia which revolves around five practices: prayer, work, study, hospitality and renewal. I enjoyed the film also as a sharp contrast to recent news reports of bigotry by a couple of other men who showed not only a lack of understanding but an uneducated view of a large part of our population. This is the Montclair Film Festival's third year. Its lineup includes dramas, comedies, documentaries, shorts, family films, panels and special guests. She wasn't there on January 2nd, but I hadn't expected her to be. The police had ousted the little old Chinese woman from the subway underpass in December and I didn't think she would return. But last week as I approached the corner where she usually sat, I was surprised to see her huddled next to the newsstand. "I didn't expect to see you," I said. She just gave me a toothless smile and said "thank you" as I gave her my donation. The musicians have returned, too. I wonder if they and the woman were given tacit permission to return. Perhaps the directives to the NYPD and MTA to eject them from the subways were meant to "improve" New York's image during the Christmas season and shield the tourists from seeing what are typical scenes in the city. For the past week, some of my McGowan cousins have been visiting New York from Ireland and Australia. As people tend to do, we cousins thought about some of the celebrations of the past. One of those was the Thanksgiving dinner hosted each year by my cousin John "Jack" Hildemann. The entire family gathered each November at The Roost in Newark. It was always a wonderful day seeing family members. Jack also made sure there was some form of entertainment for the children. 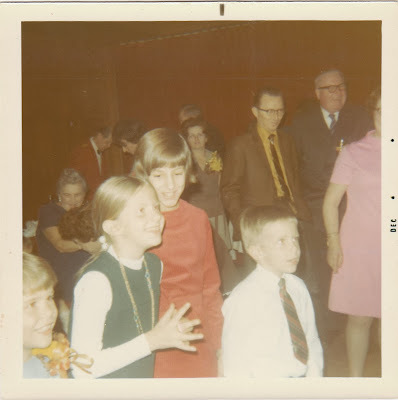 Here is a somewhat faded photo taken at one of these celebrations. I would guess the year to be about 1970. (L-R) Patricia Kowalski, Rita Field (seated), Mary Hildemann, unknown girl, Barbara Backus Kowalski, Ed Mahoney, John Hildemann, Peter McGowan, Kathleen McGowan (somewhat hidden). There is a tiny old Chinese woman who sits on the floor of the underpass that connects the Port Authority Bus Terminal with the #7 train. I’ve seen her there for the past few years, so every time I’m headed to the train, I put a small donation in the bag that she has at her feet. One Friday in late December, I had my money in hand as I approached the woman’s usual spot only to see her being ordered by two New York City policemen to leave. She said not a word and rose. I spoke to one of the policemen who told me it was by order of the Municipal Transit Authority. The mayor doesn’t like to see this, he explained, the reason being that if the city allows one person to sit here, others will follow. “It’s Christmas time,” I said. And the policeman answered, “Merry Christmas” in a sharp voice that sounded more like Scrooge than Santa Claus. Perhaps my sympathy for the old Chinese woman goes beyond her need. Perhaps it’s the thought that there but for the grace of God go I.